I wanted to share a few thoughts on WTI Crude Oil and where prices may be headed over the near-term. Higher. But that is still very short-term as the rally has already taken WTI crude oil to $62. WTI Crude Oil remains in a favorable uptrend. 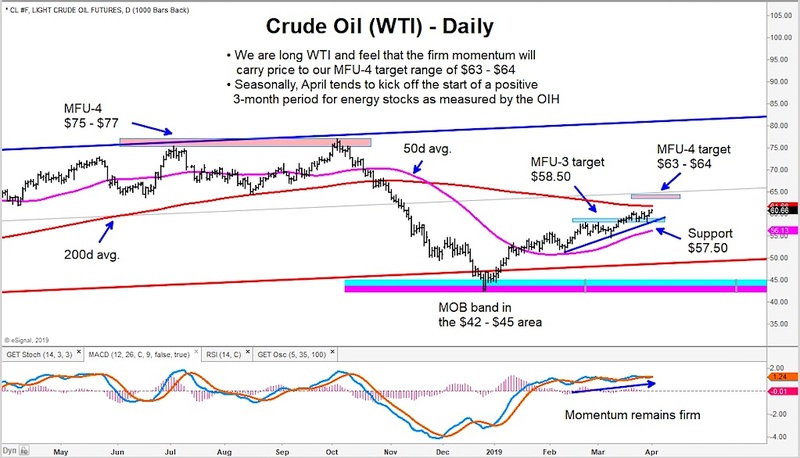 Momentum should carry Oil up toward $64 near-term. On the equity side, price seasonality for core Energy ETFs OIH (NYSEARCA: OIH) and XLE (NYSEARCA: XLE) tends to be bullish April through June (source: Erlanger Research). This would be further supported should Oil remain firm/elevated around $60 during this time. We suggest further analysis of these ETFs and components to find short-term ideas.